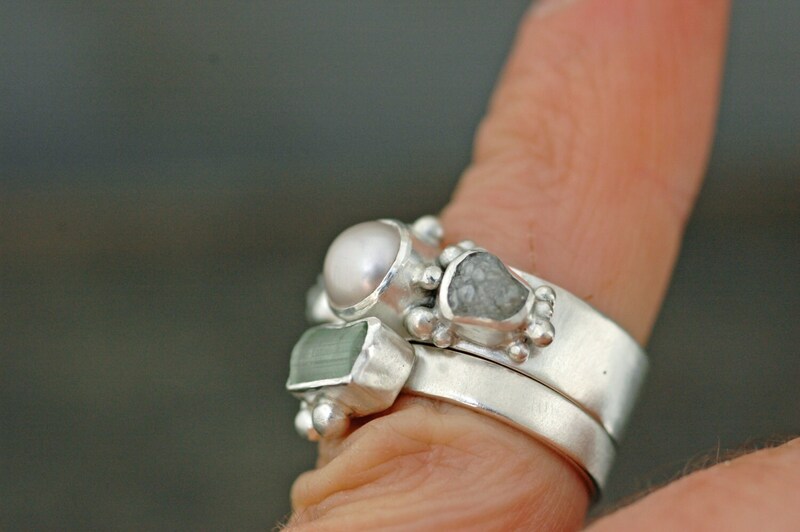 This listing is for two rings- a custom-made rough diamond and pearl engagement band, and a wedding band in the same finish. 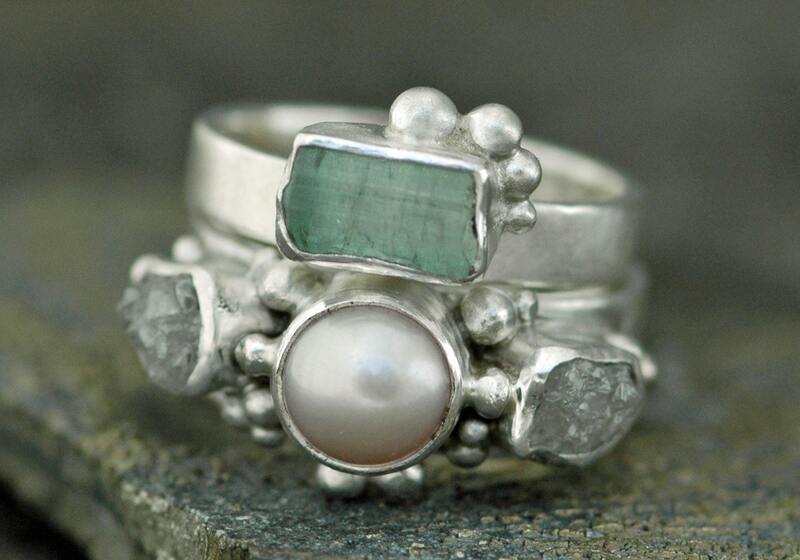 The engagement ring is designed around two rough diamonds and a freshwater pearl. 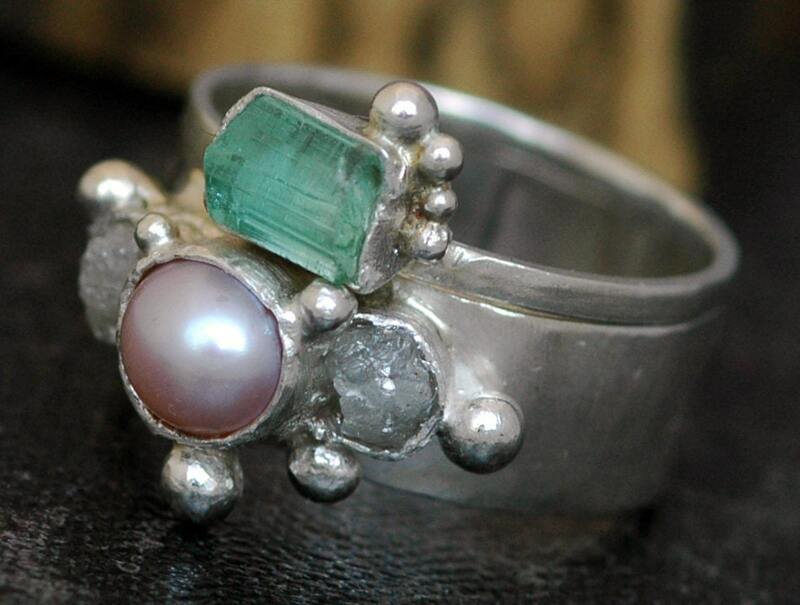 These rings will be custom made for you upon ordering, and are completely customizable. Please note that the rings in the photos are sold- the images are used to give you an idea of what your rings will look like. The wedding band sports a small rough gemstone and some granulation. I can use any type of rough gemstone that you are intersted in. 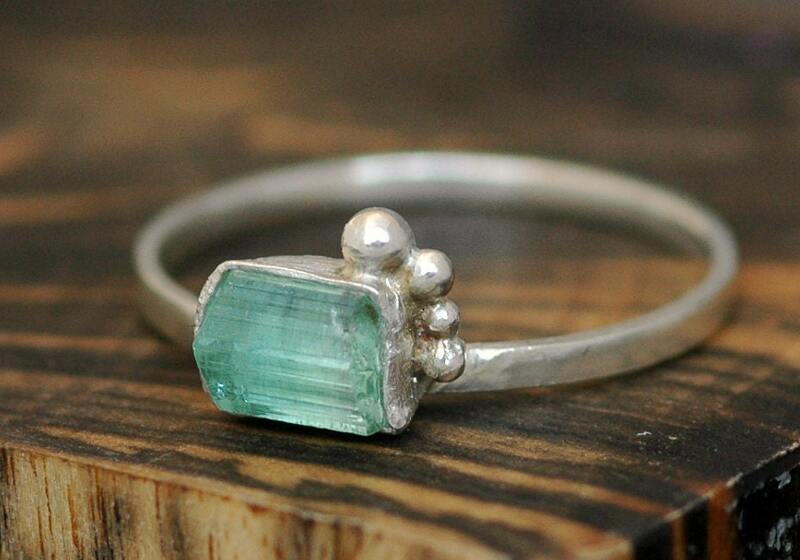 The one shown here is mint green tourmaline. Most rough gemstones can be used at this price- if you would like to replace this rough gemstone with an additional diamond, please get in touch for a cost estimate. Pearl: The pearl is freshwater, and is imported directly from the pearl farmer. Please choose your pearl colour from those shown in the final picture. Also available is a natural dark copper colour and a vivid chartreuse green. Band Texture: The engagement band is 1/4", 20 gauge sterling silver. The wedding band is around 1/8" wide, but this can vary as I cut this stock by hand. They can be given any texture you see in this listing: http://www.etsy.com/listing/58643323/textured-sterling-silver-band-custom Please contact me if you would like a wider wedding band with this listing- you can order 1/4", 3/8", or 1/2"- increasing the band width will increase the price, so please let me know prior to checking out and I can adjust the price of the listing for you. The rings you see here have been given a matte finish. I can also do high shine, hammered, pinbrushed, or brushed finish. 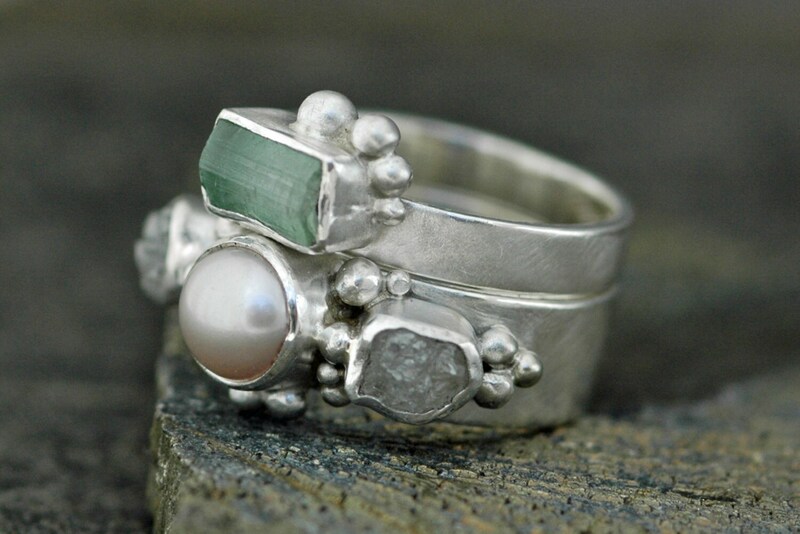 PLEASE NOTE: This ring set ships using two business day (to most locations, but some restrictions apply) courier service into the USA, two business day (to most locations, but some restrictions apply) Canada Post in Canada, and courier service with a 2-5 day delivery time interntionally. It includes a tracking number and delivery confirmation. This shipping method carries $100 worth of insurance. If you would like to have the ring set insured for its total value, please contact me for the insurance upgrade cost. The package is trackable and must be signed for on your end, so is quite safe. However, should something go awry, I cannot replace the rings nor refund unless the entire value of the set has been insured.